A few months ago, Apple redesigned its popular Macbook laptops, switching from their traditional white plastic casing to a gleaming new aluminium design, in which the body top is made of a single sheet of metal. One advantage of the new design is that it’s thinner and more lightweight than previous models. Unfortunately, the fancy metallic design is quite costly to manufacture so the new Macbook models are more expensive than their predecessors. 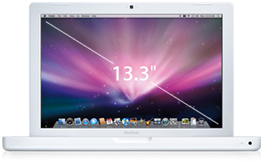 Improved graphics give the ageing White Macbook a real boost, both in performance and value for money. With this iteration of the plastic MacBook design, I think Apple has finally got this design right. Most of the kinks are ironed out. Heat is not a major factor anymore. Construction, although not perfect, is better than the first generation MacBooks. Performance is good, but there are speedier notebooks on the market from brands like HP, Acer and Dell at about the same price. None of them have what are the MacBook's best features; OS X and iLife. In my mind that is worth about a $250 premium over Windows based PCs. Design is tougher to quantify, but let's be really generous and value that at $100. Even with the premium, the hardware specifications are a little weak (by $650 notebook standards) and that is something I wish Apple would address. It may not have the striking metallic design of the other MacBook models, but the performance of the new white MacBook is more than adequate for most day-to-day computing tasks. We’re not surprised that Apple made so little fuss about this upgrade – you even have to hunt around to find the product page on its website – as it probably wants to avoid undercutting the more expensive (and presumably higher-margin) 2.0GHz aluminium model. In fact, in terms of all-round value for money the new white MacBook might actually be the best buy in the entire Mac range at the moment. So if you’re thinking about upgrading an old Mac, or switching from a PC for the first time, the new white MacBook is almost certainly the best place to start. 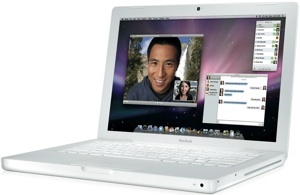 The late 2008 MacBook is a fairly significant leap forward in terms of both functionality and industrial design. Shedding the white, plastic design like the iMac before it, the MacBook's new aluminum unibody, upgraded graphics, and slightly raised price point make it clearer than ever that Apple has no intention of competing with mainstream PC notebooks. And the fact that it shares the MacBook Pro's aesthetic design and other hardware features—like a backlit keyboard and a multi-touch, zero-button trackpad—also gives the new MacBook that "coming of age" feel.